Listening to the first track of A Ghost of These Moments, “Everybody Knows” I immediately envision a dark smoky room after hours at some underground speakeasy back in the day where the a lone individual is singing to no one in particular on an upright piano. Raw vocals. Deep in thought. Yeah, “Everybody Knows”. They had my attention. The Calamity was originally formed by several members of Army of Freshmen back in 2005. There’s no doubt about it, the members are talented and given a little bit of downtime, they’ll be working on new material, because that’s what artists do, and that’s what Owen Bucey, Aaron Goldberg and Kai Dodson did one night when everybody else went out; they hung back picked up different instruments and started messing around with new material. And though Bucey stuck with keyboards, for the first time he was writing lyrics. Eventually Balt Cano and Phil Tibbs would round out the band adding a tad of an edge to their sound. 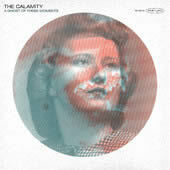 A Ghost of These Moments is The Calamity’s second release, and it contains 12 solid songs. The second track “Killing Time” establishes the power pop dynamic of the band with poignant lyrics about wanting to do something as you realize life is passing you by. As I listen to each track and hear the lyrics I’m impressed by mature nature of looking at life. Digging deep and pulling out the stops about how it’s not always easy, yearning for an easier life, people snapping under pressure, yet you can also hear the commitment to family, friends and doing what’s right. My favorite tracks are “Killing Time”, “B-Side” and “Musical Fashion”. I tend to lean towards the upbeat side of music. But I have to say that at one point listening to “Descend” I could feel the the ghost of John Lennon being channeled. It was interesting how Lennon had stripped down from highly produced Beatle tunes to working with Ono where it was more organic and real; and that’s what I hear from Bucey’s vocals, and simply produced tracks from The Calamity. The record is produced by The Calamity and Armand John Anthony, engineered and mixed by Armand John Anthony. Mastered by Paul Miner @ Buzzbomb Studios, Orange, CA. There are also guest performances from Austin Knecht, Marcella Tambouris and Zeke Berkley. I love this town with so many amazing artists who support each other and collaborate and promote and continue to create new works for us to enjoy. I recommend you add a copy of A Ghost of These Moments to your collection and see if you don’t agree.